My name is Ruby Morris. I don’t go out when it rains. Once you’ve survived an apocalypse, the old rules don’t seem to matter so much. Like today I drove a Ferrari that wasn’t mine, but no one cared (there’s no one left to care). If I want to eat only Nutella, then I can (there’s nothing else to eat). And if I want to go to wild parties in mansions, I will (this only happened once). But I’ve survived this long and I’m not going to die now. I’m struggling to put into words how much I love this book and its predecessor. If you’ve not yet read The Rain, head on over to my review to find out more about it. 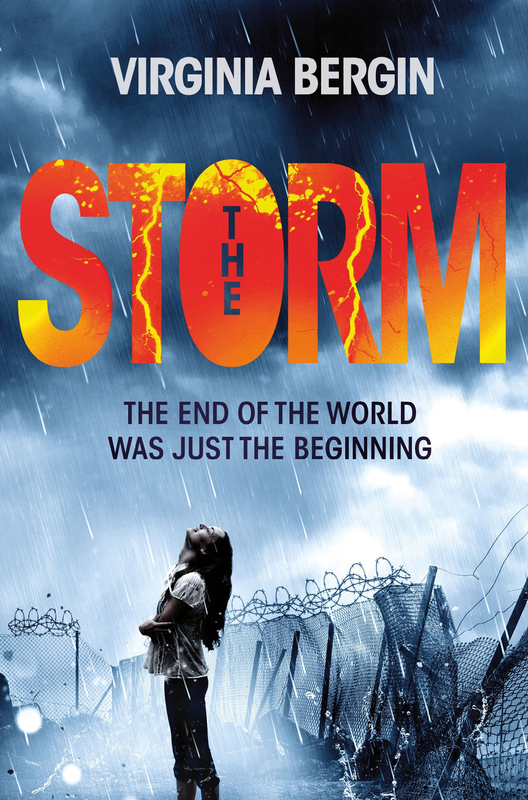 The Storm is the highly anticipated second book in the series, and quite possibly the last. I’m a sucker for an apocalyptic storyline, so The Rain and The Storm‘s killer rain that wipes out most of the world within minutes certainly fits the bill. But it’s not just the action-packed, horrifying and tension-filled plot that helped propel this series so high up my all-time favourites list; Virginia Bergin’s humorous writing style is absolute genius. You wouldn’t think that such a charming and funny character would work in such a gruesome and frightening setting, but it really, really does. I fell in love with Ruby and Darius and Princess, despite their flaws and sometimes poor decisions that’ll have you pulling your hair out. But that’s what makes them feel so real, and made it so easy to believe in. I don’t want to spoil anything for you, but I will say that while the twist is a tiny bit predictable it doesn’t matter at all because of that aforementioned genius writing style. Virginia Bergin has pushed the boundaries and ignored the rules to create a masterpiece. Ruby rambles, she talks ridiculously quickly sometimes with out taking a breath. Grammar simply flies out of the window, and that’s exactly why it works. She uses symbols, often in the place of swear words to allow the reader to come up with their own (mine tended to particularly strong but I’m sure younger readers would come up with much less vulgar language). There are words in all caps and lots of onomatopoeias and it’s exactly how I imagine I would have written and spoken when I was Ruby’s age, and if I had been left in her awful situation. The relationships between the various different characters in The Storm were intriguing, too, more so than they were in The Rain. There’s an exploration of family relationships, friendship, teenage love and interactions with people in power, and sometimes I found those relationships refreshingly unexpected. Then there’s the ending, which I actually found completely satisfying despite how open it is. I like the idea that the story is in no way over, and that, if Virginia ever decides to, she can write more about Ruby’s life after The Storm. But I also like that we can use our own imaginations to come up with our own ideas about what happened next for Ruby. There are so many questions left unanswered and so many possibilities. I can’t wait to read whatever Virginia Bergin comes up with next!